I know the title of this post has you totally excited. Who wouldn’t love blueberry ice cream? I mean, seriously, can you think of anything better than homemade vanilla ice cream, packed with sweetened, ripe blueberries? I sure can’t. And I can tell you honestly that this was the best ice cream I’ve ever tasted. In. My. Life. You HAVE to make it, seriously! It might have something to do with the fact that the ice cream is made from whipping cream and half and half…no milk at all. You never heard me say it was fat free. But, what’s wrong with indulging once in a while? If you don’t splurge on something rich every now and then, you’re really depriving yourself. You’re going to dirty a few dishes for this recipe, and you’ll have to patiently sit outside in the heat while it churns, so you might accidentally burn a few calories in the making process. That should balance it all out! The first step is to puree your blueberries in a blender. Combine the blueberry puree with some sugar and cook it just until it bubbles, then let it cool. I could have taken a spoon to the pot after this step and eaten my fill, but I wanted this blueberry ice cream bad enough to refrain. Once the blueberry and sugar mixture cools, you need to chill it in the fridge for a few hours, until it’s nice and cold. Mix up your ice cream ingredients, stir in the blueberry mixture, and then you can pour it into your ice cream churn canister and freeze away…or, you can make the whole thing ahead of time and chill it in the churn canister for up to a day. That’s what I did, because I was making it for Jimmie’s birthday party and I had lots of other stuff to do. 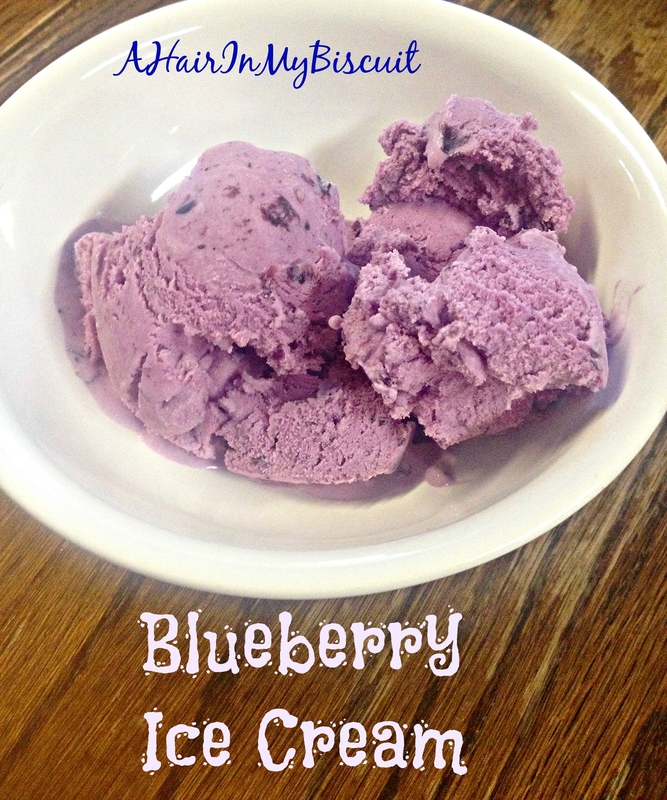 I do love recipes that I can make ahead, and this blueberry ice cream is no exception! Yep, Jimmie had a birthday! She’s 29 (again), and she brought some friends down to Big Creek for a visit, a swim and a meal. I made her a delectable white cake with buttercream frosting, which will be coming up in a future post (after I get off my blueberry kick). We really feasted on Saturday, with grilled chicken taco salads (another future post), cake, and this perfect blueberry ice cream! But you know what? You don’t need all that other stuff to enjoy this ice cream; you just need some fresh blueberries, and ice cream churn, a hot day, and a spoon! It’s creamy, sweet, delicious, and even colorful! Come on over to Big Creek and pick yourself some blueberries, if you’d like. Madre has extended an invitation to my local readers to help yourself! 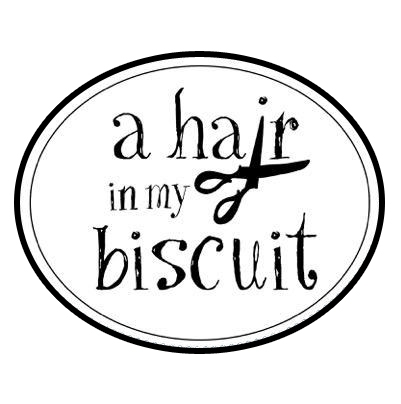 Just shoot me a PM on my Facebook page (A Hair In My Biscuit) if you’d like to come pick! I highly recommend it, if for no other reason than to make yourself a batch of this delicious blueberry ice cream! Puree the blueberries in a blender. Add pureed blueberries and sugar into a sauce pan and stir, warming until sugar dissolves. Cool this mixture, then refrigerate until cold. Mix half and half, cream, salt, vanilla and blueberry mixture in your churn canister. You can chill this entire thing for up to a day, or churn right away. Once it's done churning, leave the canister in the ice bucket packed with ice for up to an hour...it gets better as it sits there! This post is linked up with #FoodieFriDIY, Sweet Inspirations ,Over the Moon, Create Link Inspire, and Thursday Favorite Things! Yes, go if you can! So, so good. Looks sooooo delicious I can barely stand it…going to have to make some!!! Thanks for the ingredients!!! Thanks for visiting my site today Martie! I absolutely love ice cream and I use blueberries in everything I can. I am going to try this recipe as an excuse to break out my ice cream maker! Thanks for sharing. This looks delicious! Blessings to you and yours! I bet this blueberry ice cream is soooo good!! We make homemade ice cream on special occasions, so I’ll definitely have to suggest adding blueberries to the next batch we whip up. Thanks for the recipe! !